It was a rare night of just me and my two girls, so we decided to go eat Hibachi somewhere. we LOVE the Yum Yum sauce….. But we hate the awkwardness. You know, the hibachi awkwardness that is bound to happen when you don’t have enough people in your own party to fill up a table. Walking in there, just the three of us…. we didn’t have a chance. So we follow our hostess, past tables already full of people…. oh, maybe we’ll get lucky and there will be no one to sit with! Nope, they found a table with about 6 people seated already, and placed us at the end. There are plenty of reasons this feels weird to me. I felt we were already at a disadvantage, having less people in my party than the one already seated. So THEY are going to dominate the “table talk”. Not that there is much talk between us…. because we all act like we can’t see or hear each other, at the same time totally seeing and hearing each other. I’ve seen it both ways, either the group you get seated with wants to introduce themselves, shake hands, etc…, or, more commonly…. eye contact is avoided at all cost. It’s acceptable to laugh when someone takes a piece of shrimp in the face instead of the mouth… but just a quick laugh, you can’t fully commit to it. Bringing kids into the mix can really illustrate how awkward it can be….. because if your baby is being bad, or really good, doing something adorably cute, or falling flat on her face on the floor next to the table….. people WILL look, and sometimes laugh, comment to each other…. but at no point do they say these things to ME… so I never know how to respond, and end up doing what I do best, just pretending that I don’t hear them….because you know, I can’t see them…. This was funny to me, because anyone who knows my husband is aware that he is nothing if not polite. Ridiculously polite. Especially to strangers he doesn’t know. AND… he really goes CRAZY about his clothes getting food on them, and kids with dirty hands touching him. Or his clothes. So he sits there, smiles, laughs, Oh, that is so cute….how your son is putting his whole hand in his mouth….and then wiping it on my shirt… Oh, I love it! And as soon as we are out of the restaurant, he is almost shaking, desperate to get out of those clothes, and wash the spit off of him. So it’s not the ideal situation…. 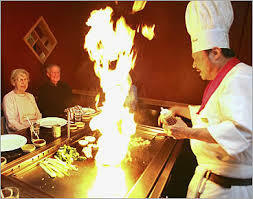 eating at Hibachi. But we still do it, probably for the Yum Yum sauce more than anything. And the fire. And the little plastic guy who pees on the fire, if you’re lucky enough to have a chef with one of those on his cart….. This entry was posted in family, food, humor and tagged awkward social encounters, eating with strangers, family dinner, hibachi, out to eat, sitting by strangers. Bookmark the permalink.